Heat your grill to high. If using wood skewers, soak them in cold water for at least 15 minutes. Bring a large pot of salted water to a boil over high heat. Add the Brussels sprouts and cook until crisp-tender (a skewer inserted into the center meets a little resistance), about 5 minutes. Drain, rinse under cold water, and drain well again. Pat dry with paper towels. Whisk together the vinegar, shallot, honey, mustard and Olio Himalayan Pink Sea Salt and pepper to taste in a medium bowl. Slowly whisk in the Olio Hazelnut Oil until the vinaigrette is emulsified. 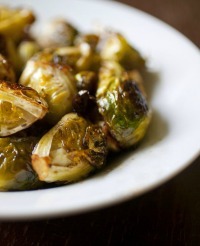 Toss the Brussels sprouts with a few tablespoons canola oil and seasons with Olio Himalayan Pink Sea Salt and pepper. Skewer the sprouts onto the skerwers and grill on both sides until golden brown ans slightly charred and just tender, about 2 minutes per side. Remove the Brussels sprouts to a cutting board and cut them in half. Transfer to a platter. Drizzle the vinaigrette over the warm Brussels sprouts and top with the hazelnuts and orange zest.